Christopher Darton Watkins, M.A. Oxon., studied at Ruskin School of Art, Oxford. 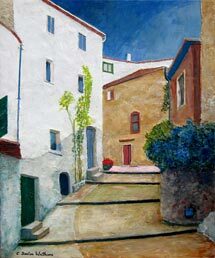 He has lived and painted in Portugal, Spain, Italy and France. He is married to a Swede and now lives and works in London and Skåne. His work is owned by three Oxford Colleges; Liverpool University; The Royal Hospital, Chelsea; The National Gallery, Lisbon; Apotekarnas Riskförbund, Stockholm; Svenska Handelsbanken, Stockholm; The Charterhouse Bank Ltd., London; Bischoft and Co.; The City of London; as well as many private collections at home and abroad. In 1990 he received a Pollock-Krasner Foundation award, '... because of the exceptional quality of [his] work and the extent of [his] artistic achievement,' and is a member of l'association internationale des arts plastiques, Unesco. For several years my interest in buildings, their shape and texture, their decorations etc., have led me to the study of doors, from Arabia to the shores of Mexico. Besides their tactile appeal, doors form the barrier between a private world and the public world outside. They both enclose and shut out, but at the same time they are the means of entry and exit between these worlds; hence their enigma. Two years ago I began to produce a series of doors made of wood and metal which are painted. More recently, after spending a winter in the South of France, I have made paintings based on medieval villages, using the architecture, texture and light to create what I hope and believe will prove an interesting series. Three years ago I began a series of Summer beaches and lakes in Southern Sweden in the winter time. Over the years I have developed my own technique. I build up the surface of the picture using a number of materials; among them plastic cement, marble dust, sand, wood and sometimes metal. I mix best quality powdered oil paints with pure beeswax and turpentine. I do not need to varnish my paintings as the beeswax acts as a protective layer and also enhances the colours. My preferred surfaces to paint on are cotton flax canvas with wood substructure for larger works and canvas covered board for smaller works. Awarded 2nd prize, British Open Painting Competition, Arnolfini Gallery, Bristol. Royal Society of British Artists Summer Exhibition. The Bear Lane Gallery, Oxford. The Royal Academy Summer Show. Guest exhibitor, bi-centenary Exhibition, Royal Exhibition of Art, Glasgow. Indar Pasricha Fine Arts, London. Anthony Dawson Fine Art, London. The Barbican Gallery, The Barbican Centre, London (exhibition arranged through A.D. Fine Art). 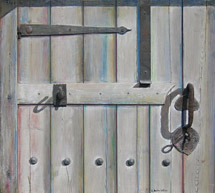 Work exhibited by Gerald Peters Gallery, Santa Fe, New Mexico, USA. The House of Sweden, London. The David Curzon Gallery, London. Contributor to A.D. Fine Art's travelling exhibition to the Low Countries, Austria, Germany and Switzerland. Summer exhibition, New Grafton Gallery, London. Christmas exhibition. David Curzon Gallery, London. Working towards Summer exhibition, Torokov.